Eric Schaller has been writing occasional SpecTech columns for the Clarion blog for a while now, and his most recent is about "mutations that involve homeotic genes and the monstrous results that can arise". And the results are, indeed, monstrous! Meanwhile, occasional Schaller collaborator Jeff VanderMeer has released a new book called Monstrous Creatures, full of monstrosities you really don't want to live without. It's been getting monstrously great reviews (including one from Charles Tan that, rather embarrassingly for me when linking to it, starts with my name). 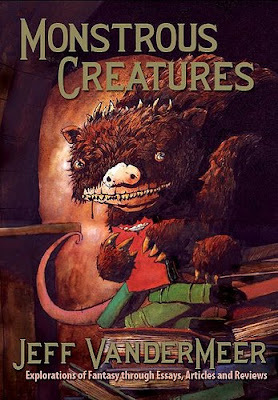 Matthew Cheney: Your recent collection of nonfiction, Monstrous Creatures, includes a remarkable array of ideas and insights, and is one of the few books I know -- perhaps the only book I know -- to plunge into both the world of genre fiction and whatever-is-other-than-genre fiction with equal aplomb -- indeed, to deconstruct, subvert, and ignore the very boundaries said to create "genre fiction" and "whatever-is-other-than-genre fiction". Did you set out to create such a project, or did you discover it when you began to collect the disparate pieces into a book? Jeff VanderMeer: Shhhwmmwoowoooogggg! Gwarrrrffffmmmaaaaawwwg! Meat! MEAT!